Soda, sports drinks and energy drinks are loaded with sugar and empty calories. Soda is the number one source of added sugar in the American diet, which isn’t surprising since a 20 ounce bottle of soda contains about 17 teaspoons of sugar. So it makes sense that overweight people often turn to diet drinks to help them slim down. But recent research suggests that this weight-loss tactic may backfire. Researchers from the Johns Hopkins Bloomberg School of Public Health studied the patterns in diet drink consumption and calorie intake among US adults of various body-weight categories. Their results were recently published in the peer-reviewed American Journal of Public Health. They analyzed data obtained from the National Health and Nutrition Examination Survey (NHANES), which is a population-based survey designed to collect information on the health and nutrition of the US population. The researchers used the NHANES data collected from 1999 through 2010. The study sample consisted of 23,965 adults who reported all of the food and beverages that they had consumed in the previous 24 hours. 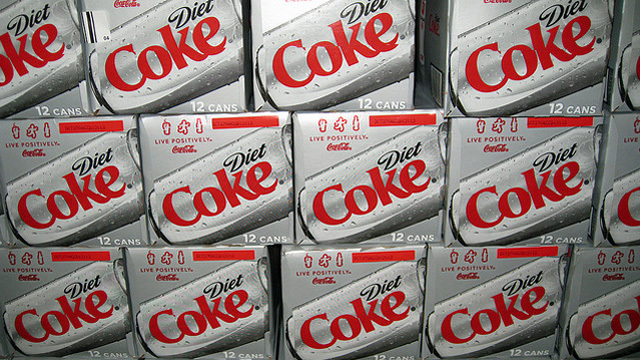 The study found that overweight and obese adults drink more diet beverages than healthy-weight adults. Overall, 11% of healthy-weight, 19% of overweight and 22% of obese adults drink diet beverages. This suggests that overweight and obese people may indeed switch to diet drinks to reduce their calorie intake when trying to control or reduce their weight. Unfortunately, the researchers also found that the overweight and obese diet drinkers made up the calories by eating significantly more food during meals and snacks, in comparison to overweight and obese adults who drank sugar-sweetened beverages. The net increase in daily food consumption associated with diet drink consumption was 88 calories for overweight and 194 calories for obese adults. In comparison, healthy-weight diet drinkers ate fewer food calories – 73 less calories per day – than their counterparts who drank sugar-sweetened beverages. High doses of artificial sweeteners are found in diet drinks. Earlier research found that the regular consumption of these artificial sweeteners alters the reward a person experiences from sweet tastes and disrupts appetite control. This could explain why the heavy adults who drank diet beverages ate more food calories. But it doesn’t explain why this wasn’t the case for healthy-weight diet drinkers. Further research is needed to understand both the biological and psychological response to regularly drinking diet beverages with artificial sweeteners. But it is clear that you aren’t going to drop pants sizes by simply switching from Coke to Diet Coke.